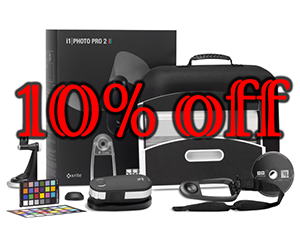 CHROMiX is having a sale on ALL i1 products from X-Rite, for a very (very) limited time. Any product that has an "i1" on it will cost you 10% less up until midnight of Wednesday, November 21st. Purchase any 'i1' product before Thanksgiving and we'll take an additional 10% off the CHROMiX price for all i1 items on your order. All i1 product is included in this sale.